Thanks to our award-winning charm, Shelley Christner and her husband Vaughan Christner decided to set up shop in Denton. In addition to co-running DIME, they also run their Etsy store, Home Again Home Again, out of Denton. 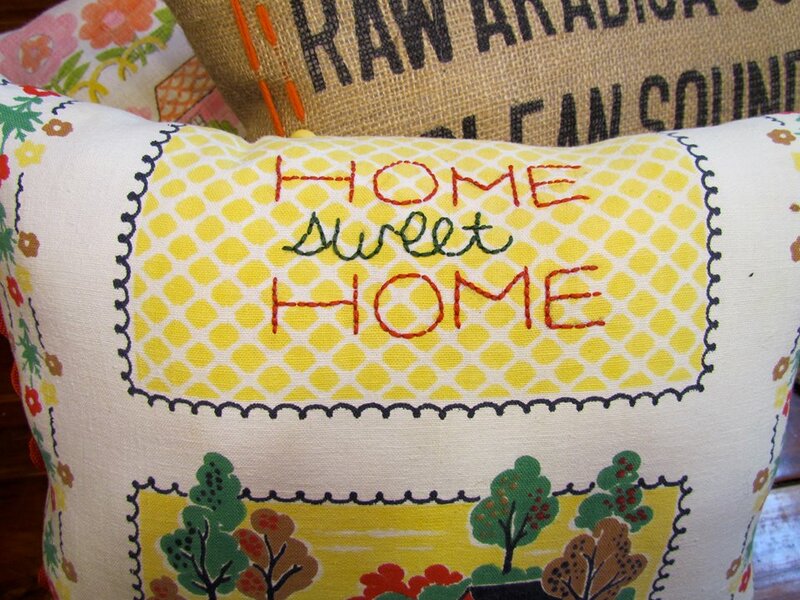 Home Again Home Again specializes in handmade/refurbished furniture, hand-stitched pillows and the most precious tea towels that ever did grace your stove. Read our interview below and make plans to head out to the DIME Summer Bazaar this Saturday at the Center for the Visual Arts from 10am - 4pm to shop local handmade goodies (Get there early to grab a special We Denton Do It sticker). We'll have a Jive Five for you to study before Saturday gets here, but go ahead and get your crafting gloves ready now. Shelley – can you start by sharing with us a little bit of your history with Denton? We moved to Denton almost 6 years ago, but had commuted to Denton from Celina for several years as our 3 children went to a small private school here. We found such a great community we decided to move here. I love your shop Home Again Home Again – it was one of my favorites for years during the Etsy Denton Fair days... and it still some of my favorite at the DIME store. What inspired you to start your own business? An empty nest and a head full of creative ideas. As our kids were about to leave the nest I had a desire to start a business using the creative gifts that had developed as we raised our family. We had built several comfortable nests/custom homes through the years and Vaughan(who is a general contractor) had always given me lots of room to incorporate my creative Ideas and we discovered that we were a good tag team, my ideas and his skilled hands. We started upcycling and building furniture from found and cast off object and I brushed up on my sewing skills after awhile to make housewares. What was the best piece of business advice you were given when starting out? Everyday will bring a new challenge, how you respond will make the difference. Where are your favorite places to find your fabulous vintage pieces? I consider them my “treasures” and I find them mostly at Estate Sales and Thrift Stores. I especially love to look when we travel. Our son, Stiles and his wife, Lauren live in Denver and it is truly the thrift store land of milk and honey. We always make time to stop along the way anywhere we travel. SCRAP Denton is also a treasure trove, and is a favorite place of mine. That is hard to answer......right now I am having alot of fun making applique tea towels, but I love making furniture, even though Vaughan is the actual one who makes it.....but I love coming up with new ideas and designs, and seeing the amazing talent that Vaughan has in handcrafting my dreams. Tell us about your roll with DIME. How did you get started with it? 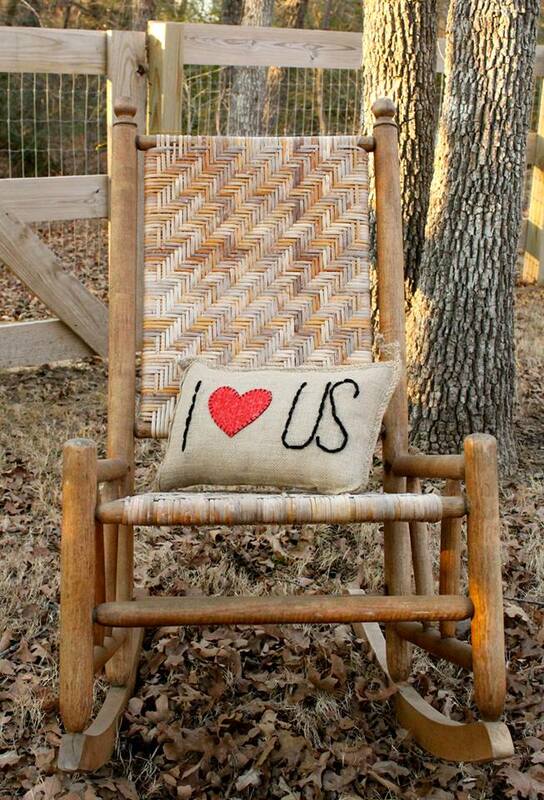 I am the co-owner of The DIME Store with Rachel Aughtry, and am co- founder of DIME which was formerly Etsy Denton. I got started with it after Rachel and I had developed a friendship through a handbag my daughter Shea bought at Art Six....long story short, we both were selling out at the Denton Community Market the inaugural season and we had a reporter from the Denton Record Chronicle approach us about all the Etsy sellers at the market and had we considered starting a group in Denton like what was happening in Dallas and Ft Worth? She said if we did she would write a story about us. So we agreed to start Etsy Denton as a way to have community with other makers in Denton. We decided to host a barn sale at my home to kick off our new organization of makers. The paper wrote there story and we had about 400 people come out to shop from 14 vendors, and well, the rest is history. We moved to the Center for Visual Arts in the Fall and have had 4 shows that grew each time, which led us to decide to open The DIME Store. My day to day.....Rachel and I split the time at the store, working either mornings or afternoons and every other Saturday unless we have an event. Whether morning or afternoon we overlap our time in the store from 1-3 to confer on all the happenings of the business. Working in the store is so much fun. I enjoy meeting all the customers and visiting. We also have a working studio with our sewing machines behind the counter so that we can keep up with our own personal making for the store and for our Etsy shops. What were the challenges in opening the DIME Store? The myriad of details that have to be taken care of, DBA’s, sales tax license, certificate occupancy, trash, electric,gas, telephone service, sign license......on and on and on.....so many details. Is it tough to balance both the DIME Store and its many events as a whole, and your own line? Yes, balance is definitely a challenge but, having a great “Partner in DIME” helps a lot. Rachel and I balance and encourage one another with the many hats that we each wear. You can catch Shelley Christner this weekend at the Etsy Denton Summer Bazaar, but she'll probably be pretty busy. Stop by the DIME store sometime during the week if you want to talk her ear off about your own crafting. Better yet, "like" their page on Facebook and plan on attending one of the always-informative classes they host from time to time.